She shared with me how she began to gather a small group in the courtyard and taught them the Lord’s Prayer. “If we say this, I believe the Most High God will help us withstand the heat.” Each day her classmates of different religious backgrounds would repeat the Lord’s Prayer. Eventually, the students began to ask this young girl about more stories about Jesus. Sona began to tell Bible stories in the courtyard, until eventually several students believed. As an attendee at the church planting conference, Sona enjoyed the company of others taking risks for the Gospel in South Asia, prayed earnestly for others’ souls, and learned more about the Bible and stories she could share. She planted churches and small groups at school. Upon leaving the training, I asked Sona if there were a message she’d like to give Americans. Without hesitation she said, “I would tell them that Christ died for them. What more can they do but live for him every day.” Sona, as a young girl, understood Paul’s urgent plea that Christ’s love should compel us to live for the One who died and was raised again (2 Cor. 5:14-15). 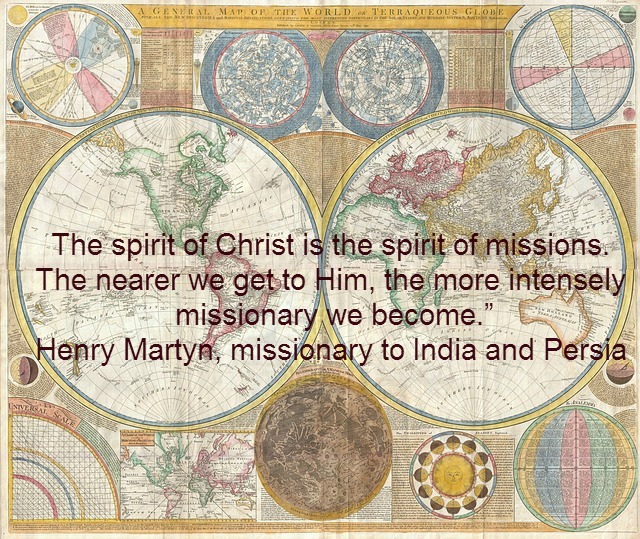 Henry Martyn, missionary to India and Persia stated, “The spirit of Christ is the spirit of missions. The nearer we get to Him, the more intensely missionary we become.” Mission simply means to heal and restore creation – all of creation. Jesus Christ was a missionary – sent with the purpose of restoring the world back to God. Sona, a lover and follower of Jesus, had a fire in her heart ignited with courage and compassion. A simple teenager realizing she could make a difference in a school courtyard. How about you? Does Christ’s love compel you? Where is God encouraging and challenging you to live with both courage and compassion? Please share your comments!